The zoological contraption called Nigeria and her government should understand that it is obvious that this British entity created by Fredric Lugard has collapsed for good beyond repaire or reconstruction. As they have deliberately missed every single opportunity to do that starting from Aburi - Ghana. And IPOB worldwide led by its supreme leader Mazi Nnamdi Kanu, can never be a party to any meeting or dialogue to continue to coexist with Hausa- Fulani and Yoruba oligarchy as one British contraption called Nigeria again no matter any tempting offer they might present to us. They should understand that over 6.5 million innocent Biafran citizens have been murdered to keep this evil contraption one with impunity. The call for restructuring can not be used as an exchange for our total freedom from this evil contraption called Nigeria. The sacrifice of our fallen heroes and heroines is for our total freedom and not for restructuring this British experiment called nigeria. Therefore we hereby send a warning signal to the Nigeria goverment that we are ready for whatever it shall take us to get Biafra restored. We were massacred because we want Biafra. We were abused because we want Biafra. Biafra is our identity and we can't in any way denounce our identity; we swore an oath to get Biafra and we are not relenting. We are not afraid of death or war. If Nigeria wants war, we shall confront Nigeria with war for Biafra to come. If Nigeria wants peace we shall let peace be for Biafra to come. If Nigeria wants handshake, we shall straighen our hands in handsshake to Nigeria for Biafra to come. But we are not going to exchange anything for Biafra. 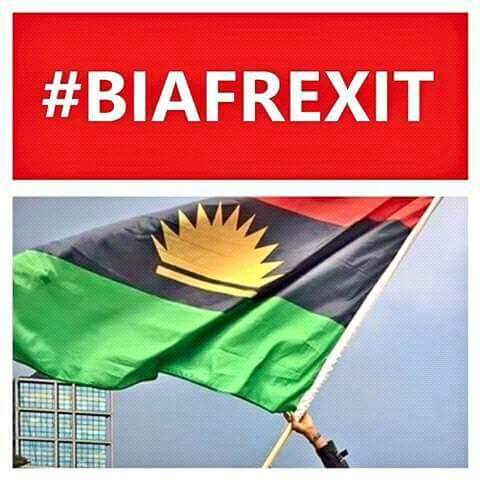 It is in the best interest of the Nigeria government to toe the part of peace and behave like a civilised nation and call for a United Nations supervised referendum for BIAFREXIT. We commend the coalition of Arewa Youths for the bold step they took in calling on A.U, EU, UN, US, UK and local and international civil societies to mount pressure on this animal kingdom called Nigeria to set a date for referendum for BIAFREXIT so that we can exit this unnecessary union that we are forced into for over 100yrs. Yes we commend them for the points they raised, and we join them to call on United Nations to order for a referendum in Biafra land. It's on record that we Biafrans has being peaceful on our agitation for self-determination; even as the largest freedom fighter in the whole world with presence in over 100 countries of the world, there has never been any record of violence in all our activities. While we commend them for the call for a Referendum, we frown at their planned massacre of Biafrans as contained in their quit notice ultimatum to violently evict Biafrans from their territory on the expiration of the order. Though we are not surprised of this barbaric pronouncement because they have always been barbaric in nature; it's part of them and the records are there for everyone to see. They have been terrorizing us in every slightest event since 1945 till date. So we advise our people to come back home. And we also call on United Nations to warn the islamic Arewa because we shall never again fold our hands and allow the northern youths terrorists empowered by Nigeria goverment to terrorize us again. The fact that we are peacefully exercising our right for self-determination does not mean we will fold our hands and be slaughtered again. In the event of any aggression towards us, we shall activate our right to self-defense and defend our lives and properties both in that northern part of Nigeria and in Biafra land as we have nobody to do it for us. Again we also call on the so-called political leaders in Biafra land to rise up to their responsibility and stop beating on about the bush in order to be politically correct; but to use every opportunities and authority given to them to call a spade spade. Nigeria have totally collapsed and when a building is collapsed, to rebuild it you need to totally dismemberd it and lay a new foundation. In simple term they should be bold enough in asking for referendum because that is the only language we shall listen to from Nigeria. Anyone from anywhere who join us to demand for this referendum shall be identified as a friend. To this end therefore, anybody, be you a traditional ruler, a youth leader, civil society organisation, constitutency representatives, a Senator, a Governor or any type of leadership; whether as elder statemen in Biafra land that refuse to be bold enough to call for Biafra referedum is henceforth on his own. Listed below are the enticing things Biafrans under the leadership of Mazi Nnamdi Kanu CAN NOT DEMAND AND SHALL NEVER ACCEPT; any meeting or dialogue based on these following 5 topics for peace are null and void as Biafrans can never be party to any of them. All Biafrans demand is REFERENDUM.